Many experts believe that there is a shortage of luxury hotels in Nashville area. For those looking for high-end accommodation in the capital of Tennessee, we have compiled a list of best Nashville luxury hotels, that comprises both 4-star and 5-star hotels located in various interest points of the city. If you are looking for the best places to stay in Nashville Tennessee for nightlife, business or pleasure, you will surely find at least one convenient option on our top. 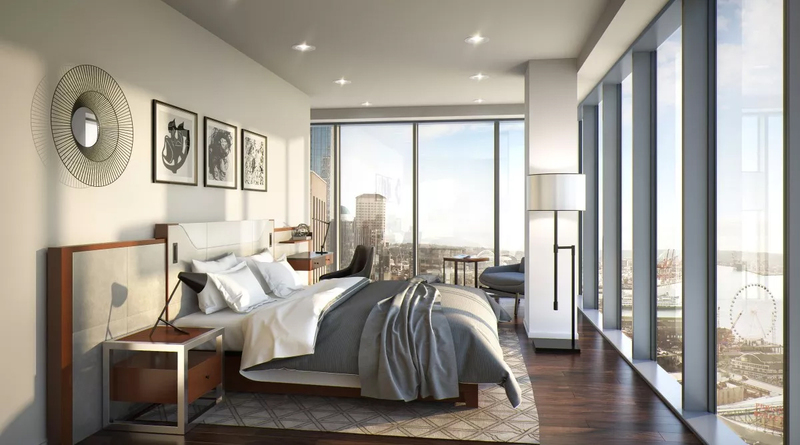 Opening in October 2016, the Thompson Nashville gets the name from Senator Fred Thompson who passed away about a year before the luxury boutique hotel opened. This Nashville 5-star hotel delights its visitors with lots of surprises. Kick up your heels at the dance parties at the L.A. Jackson rooftop bar. Book an in-room fashion consolation with a denim specialist to get jeans made just for you. Enjoy the custom-made, bottled cocktail mixes found in each room’s minibar. Admire the art located throughout this hotel in the Gulch. This Nashville luxury hotel is suitable for romantic trips, corporate events, and wedding celebrations. Club Hotel is located right across the street from the Grand Ole Opry, so taking in a show is very easy. Relax in the spacious living rooms complete with a wet bar. Start your day at the large breakfast bar featuring all types of Southern favorites. Keep up with your exercise regime at the well-equipped fitness center. Relax in the indoor whirlpool. Staying at this Nashville 4-star hotel allows you to be close to everything Music Row has to offer. Located only 7 miles from downtown, this boutique-style hotel is one of the best places to stay in Nashville for nightlife, but also for business travelers, meetings, and corporate events. Located just steps away from Vanderbilt University, Lowes Vanderbilt Hotel is another great 5-star hotel in Nashville. When you arrive, make sure to play the jukebox located in the lobby, because it is filled with songs of celebrities that have stayed at this Nashville luxury hotel. Start your day with a steak and grits. Enjoy the blend of Appalachian and European food at Mason’s for lunch in this Nashville luxury hotel before enjoying a juicy steak at night. Get around town in the complimentary Mercedes GL450 SUV. Just minutes away from the city’s most popular attractions, Lowes Vanderbilt Hotel is one of the best luxury hotels in downtown Nashville and one of the best places to stay in Nashville Tennessee. World War II reclaimed barn wood and bamboo-paneled walls help to create the mid-century décor at the Hutton Hotel. This Nashville four star centrally-located hotel is close to Vanderbilt University, and a short 10 minute walk to Music Row. Enjoy the upscale New American cuisine at the 1808 Grille. Sip a traditional cocktail at the bar. Cat and dog lovers will be delighted by the services offered to their animals at this great luxury hotel in Nashville. As for accommodation options, the hotel offers luxurious guestrooms, suites, and penthouses. It is one of the best places to stay in Nashville for music lovers. Connected to the Nashville Convention Center, the Renaissance Nashville Hotel offers travelers great convenience in Nashville downtown area. Stroll to the rooftop bar at the end of a long day of sightseeing or business. Dine on delicious Southern favorites at Commerce Street Grill. While business suits are the most common attire in this area of Nashville, there are also plenty of places to go in your jeans at this Nashville luxury hotel. The generous conference space makes it one of the best places to stay in downtown Nashville for business travelers. Opening as a train station in 1900, the Union Station Hotel is listed on the National Register of Historic Places. This iconic Nashville boutique hotel is one of the best examples of Victorian Romanesque Revival architecture in the United States. Much of the original architectural detail is preserved, including the 65 foot barrel-vaulted stained glass ceiling and many rare bas-relief sculptures, making it one of the best places to stay in Nashville. Large rooms provide plenty of space in this 4-star Nashville hotel to spread out. Enjoy delicious meals at Sambuca while listening to live music seven days a week. It is one of the most stunning luxury hotels in Nashville that is also pet-friendly. Guests looking to reconnect with nature need to consider The Inn at Fontanel set on a 186-acre paradise. Located on the same property is the former home of Barbara Mandrell. Listen to the concerts at the Carl Black Chevy Woods Amphitheater. Play on the ziplines or use the complimentary bikes to explore the property. Enjoy a private wine tasting from Natchez Hills Winery. Each guest staying in this six-room luxury Nashville hotel can enjoy a breakfast cooked just for them. It is one of the best places to stay in Nashville for romantic getaways or relaxing retreats. The 404 Hotel is located very near the iconic 404 Restaurant in the Nashville’s Gulch district. Hiding in plain sight, this 5-star hotel in downtown Nashville features five rooms. Photographs by Caroline Allison adorns the walls of each room. Each spacious room in this urban oasis contains a king bed with a comfortable seating area containing vintage furniture. While finding this hotel can be trickier than finding most Nashville luxury hotels, the effort is well worth it when you want to explore the Gulch area. It is one of the most unique luxury hotels in Nashville, suitable for romantic hideaways. Located in a former bank building, The Hotel Indigo contains many features from its earlier life. Listen to live music at this Printer Alley’s District Bar and Kitchen. There are many things you can do in this unique Nashville luxury hotel. Stay on your exercise regime by working out in the large exercise room. Enjoy an easy walk or drive to most downtown Nashville attractions as they are located less than a mile away. It is one of the best Nashville luxury hotels to experience the nightlife vibe, but also for business travelers. Each of the rooms at Music City Loft is named and decorated to reflect part of the country music industry. Among the Nashville luxury hotels, this is the only that has Elvis, Waylon and Willie rooms. Each room contains its own unique floorplan. Visitors can conveniently park in a nearby parking garage with passes supplied by the hotel. The Ryman Auditorium is less than a block away, making this one of the best Nashville luxury hotels for people attending events there. Nashville is a wonderful place to visit. Unfortunately, there are only few luxury hotels in Nashville area. Choose the one based on your reasons for visiting the city from our list of best Nashville luxury hotels. If you have stayed in any of these lavish hotels in Nashville Tennessee, then we would love to hear your experiences. Alternatively, if we have missed some good Nashville luxury hotels, then please share the information with us.